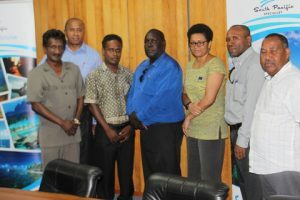 A delegation from the provincial Government of the Solomon Islands’ Western Province wants more programmes from the regional tourism body to assist in upskilling their local workforce and developing their industry as a whole. Western Province Minister for Culture and Tourism, Hon Christian Mesepitu made the comments when he paid the South Pacific Tourism Organisation office in Suva a courtesy visit yesterday. “We know SPTO is regional tourism organization that is there to help regional countries to further develop their tourism industry and we believe that by visiting SPTO, we can learn about its functions and also how we can benefit from various programmes it provides,” he said. Hon Mesepitu said according to some participants at the Farm to Table culinary workshop held in Munda last month, they received valuable tips on how to use local ingredients and flavours to their recipes. Deputy Secretary for Western Province, Patrick Toiraena said they were in Fiji to learn how Fiji’s tourism industry benefitted local landowners and the people on the ground. “We would like to take back the lessons we learnt here to the Western Province and use it in our own context,” Toiraena said. Deputy Premier Hon Wayne Maepio said Government has announced that it planned to build three new hotels in Seghe in the Marovo Lagoon, Roviana Lagoon in Munda and Saeraghi in Western Gizo and they were trying to look at all aspects of this development to ensure benefits trickled to the people, hence the importance of their visit to Fiji. The delegation also mentioned that two large cruise ships would be visiting Gizo, the capital of the Western Province in September, necessitating the development of adequate port infrastructure that would play a significant role in the further development of the province’s small yet emerging cruise tourism industry. South Pacific Tourism Organisation Acting Chief Executive Alisi Lutu said the Western Province visit was a testament to SPTO’s regional tourism activities in the Pacific and that SPTO was reaching out into the more densely populated rural communities of our members and beneficiaries that needed these types of tourism and development programmes. .
“We welcome our honored visitors from the Solomon Islands’ Western Province and anticipate that through continued collaborations with the Solomon Islands’ Ministry of Tourism and the Solomon Islands Visitors Bureau, our tourism programmes continue to reach our local industry stakeholders in this province. “They have been provided a substantive overview of our programmes for 2016 and what to look forward to in 2017. We trust that their visit to Fiji was valuable and that these learning and new contacts gained will enhance their tourism development initiatives and plans for the Western Province. Tetepare Eco Lodge in the Western Province of the Solomon Islands is the latest partner to join the SPTO’s private sector membership. In the hopes to uplift the global promotion of the Hapi Islands, the Solomon Islands Visitors Bureau will be leading a strong delegation at next week’s South Pacific Tourism Exchange in Gold Coast with the likes of the Solomon Airlines, Ropiko Beach Resort, Agnes Gateway Hotel, Solomon Islands Dive Expedition, Guadalcanal Travel Services, Uepi Island Resort, Honiara Hotel and Maringe Lagoon Lodge.